"A UNESCO World Heritage Site"
New Lanark is a restored cotton mill village, founded in 1785, close to the Falls of Clyde. Once Britain’s largest cotton manufacturing centre, the village rose to fame as a model community under the enlightened management of Robert Owen (1771-1858). Although life in the cotton mills was never easy, Owen ensured that everyone had access to good living conditions, free education and health care, and were able to buy goods at reasonable prices in the Village Store, which was the inspiration behind the Co-Operative movement. It is an Anchor Point of ERIH - The European Route of Industrial Heritage. The Clyde Walkway, a long distance footpath, passes through the village. Today, as you wander around New Lanark and the surrounding Wildlife Reserve, it is easy to imagine what life must have been like back in Owen’s time. You can explore the fascinating history of the village. Your visit starts in what was the Institute used by villagers and mill works for entertainment. From here you take a magical chair ride, the Annie McLeod Experience, which through the eyes of a 10 year old girl, who worked in the mills in the 1820's, tells you a little of the history of the site and what it was like to work there and for Robert Owen. After the 12 minute ride you walk through the engine house and see the two large engines which would have been originally powered by the water from the River Clyde outside. This takes you up to the 'Rope Walkway passage' into Mill 3. Although this passageway is new it takes the route of the ropes that took the power from the engine house to the mill buildings. Within mill 3 there is a exhibition of how the cotton mill worked and what life in the village would have been like when the mill was in full operation. Today there is some 19th century working textile machinery which makes yarn that is sold in the Mill shop next to the cafe. At the top of Mill 3 you can get access to a roof garden and viewing platform which is on the roof of Mill 2, giving some stunning views of the River Clyde and the other buildings in the village. You can visit Robert Owen's school for children up to the age of 12 when they then started to work in the mill. He also offered education to those adults working for him that wanted to by providing classes in the institute building. Within this building there is also a theatre, and interactive gallery and exhibition space which is used for changing displays. The village store today sells ice creams, sweets and other tourist paraphernalia, but it also has a room set up to display what it might of looked like in Robert Owen's time. Robert introduced the concept of buying food on a voucher scheme which he supplied to his workers. The food was sold to them at an affordable price and it still made a profit. This scheme was the inspiration behind the Co-Operative movement which still exists today. There is also the two extremes of living within the village in the form of the mill workers cottage, where you get to see what it was like to live in the cramped surroundings in the time of Annie McLeod, the 1820's, when there were around 2,500 people living in the village usually in one room with 'set-in' beds and 'herlie' beds. During this time Robert Owen installed baths in the Institute building and the school he created washed the children's clothes 3 times a week. There are also some rooms set out to how it was in the 1930's, when 1,000 people lived in the village and most families generally had two rooms with both electricity and an indoor loo. At the other end of society you have Robert Owens house, where you get to wander both the ground floor with a study room, drawing room and dining room, while downstairs is the kitchen and accompanying rooms. If you wander down to the Dyeworks, you will come across the office or the Falls of Clyde Wildlife Reserve, with 3 or 4 waterfalls nearby and over 100 types of birds. While next to the Mechanics workshop there is a chimney and viewing points to get a good view of the bottom section of the Falls of Clyde. The tallest waterfall is the Corra Linn which is at a height of 85ft. To see this you need to take a woodland walk (3km round trip), which you can access from the village. On our walk back to the visitor centre from here you can walk pass a working waterwheel which is used today to provide power to the whole of the village. If you are a UK tax payer you can gift aid your passport ticket admission price and visit the site as many times as you like for free for 12 months. A hotel and self catering accommodation is in what would have been originally Mill 1 and the Waterhouses. While in the nearby Wee Row (originally accommodation for the mill workers) there is a youth hostel. 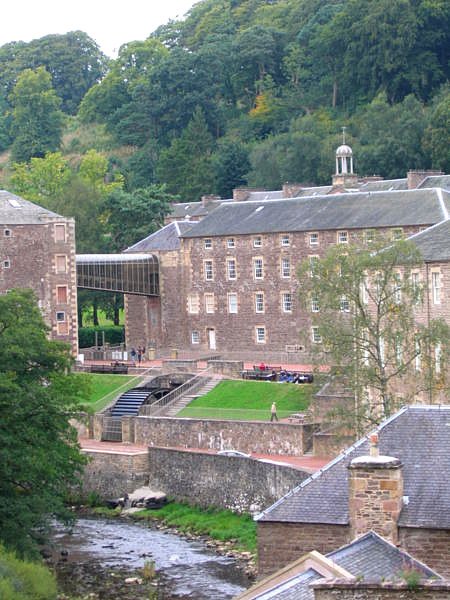 All other buildings on site are lived in by today's New Lanark residents. Getting there: New Lanark, is less than an hour’s drive from Glasgow (25 miles/40 kms) or Edinburgh (35 miles/56 Kms) and is well sign-posted from all major routes. Access: The car park is up a very steep hill. However there are a limited number of disabled spaces in front of the visitor centre and the hotel. The Wikipedia article on New Lanark gives information on the history of the village and people, a house by house description of the village and has a large number of photographs. Plus other links. Opening Times: open every day from 10am-5pm April-October, 10am-4pm November-March, Closed 25 December and 1 January only. Charges: Full Access Tickets Adults £10.50; Child (3-15) £8.50; Senior, Students, Disabled £9.50; (Carers Free); Family (2+3) £34.00; Free parking. See website for other deals. Notes: If you are a UK tax payer you can gift aid your passport ticket admission price and visit the site for free for 12 months.